Arctic Char with Kale Pesto features the delicate tasting fish grilled and topped with a zesty pesto sauce, served over a bed of pasta. A healthy and delicious seafood recipe. Read along for details, including our wine pairing, or click here to jump down to the recipe. OK, Arctic Char with Kale Pesto may not seem super creative to regular readers of Cooking Chat. We make a lot of kale pesto here, and topping various seafood with kale pesto is one of our favorite ways to use the green goodness. If you are new here, our growing list of ways to use kale pesto can be found here. As I noted when I served Grilled Arctic Char with Pineapple Salsa, char has a delicate flavor a bit like trout, though the fillet looks a bit like salmon (photo below is from the previous recipe with pineapple salsa). 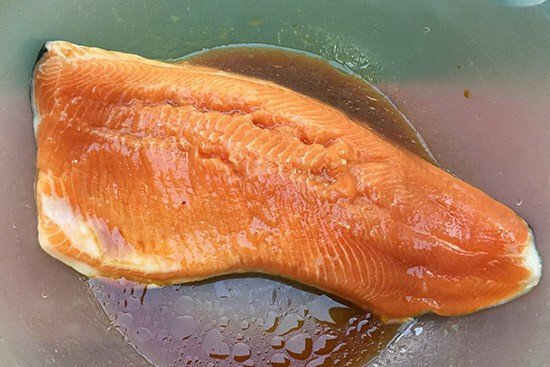 You can learn more about Arctic char on this seafood industry site. 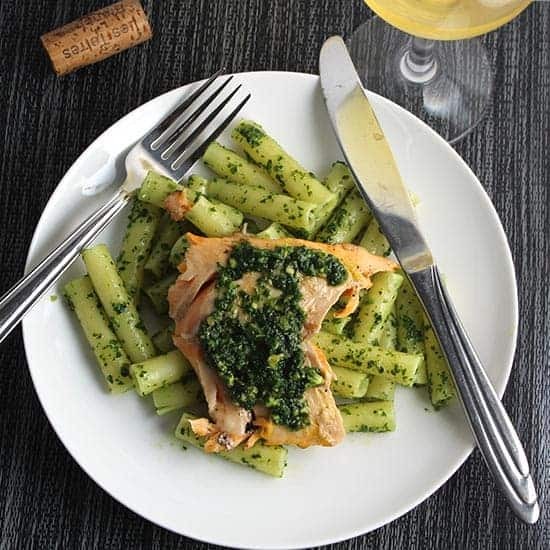 The delicate taste of Arctic char makes kale pesto a great topping, as the fish lets the zesty flavors of the kale pesto shine. I served the Arctic Char with kale pesto on a bed of ziti that had been tossed with a bit of the pesto. I enjoyed the char mixed together with the pasta, as well as having some of the fish on its own. 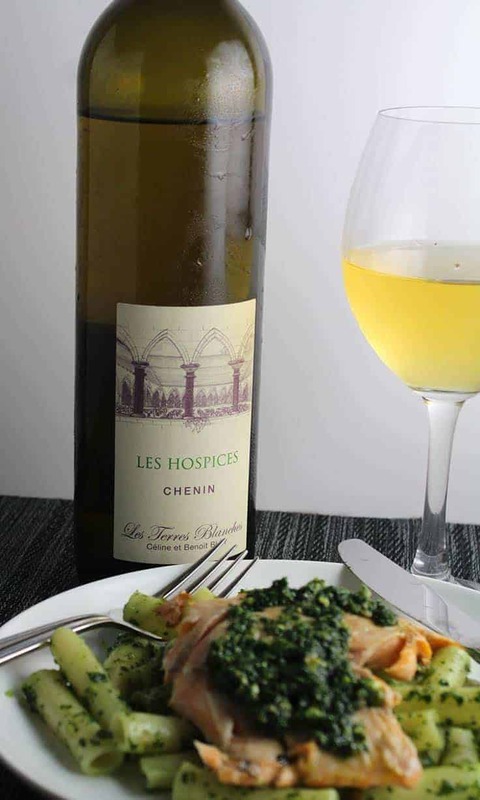 Making this Arctic Char with Kale Pesto seemed like a great excuse to open the Les Hospices Chenin Blanc ($20, 13% ABV) from Domaine Des Terres Blanches in the Anjou region of the Loire Valley. I had just sampled it at Pairings Wine and Food the other day, and correctly anticipated with would go well with the char and kale pesto. This Chenin Blanc is full bodied, with taste of honey and apple, and a nice long finish. The fruit and honey refreshed the palate nicely after bits of the flavorful pesto, and the body of this white wine worked well with the fish. I’m thinking this Chenin Blanc would also be great with roasted chicken, especially if it is prepared with some lemon. A good quality wine I will certainly pick up again. 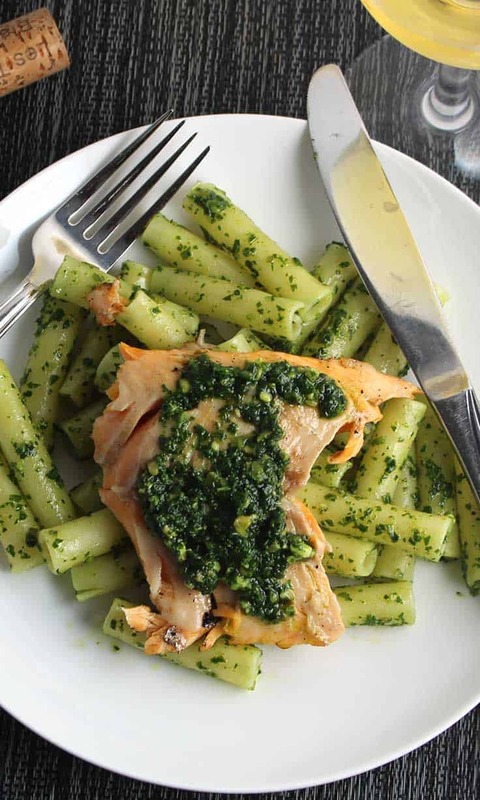 Grilled Arctic char topped with kale pesto, served on a bed of pasta, makes for a tasty and healthy meal. Put water on to boil as you make kale pesto. Cook some pasta according to package directions, and toss with about 2 tablespoons of the kale pesto. Cover and keep warm on the stove while you grill the fish. Combine 1 tablespoon olive oil with some salt and pepper in a large bowl. Rinse the char fillet, pat dry. Place the fillet in the bowl with olive oil flesh side down, then turn over to the skin side to get the fish well coated. Gently shake off excess oil, then place the fish carefully on the grill, skin side down. Grill on the skin side for 4 minutes, then turn over to grill for 3 minutes flesh side down. Note: the skin may stick to the grill, that is OK. Just place the fish flesh side on a clean portion of the grill and remove the skin later. After the char has grilled for 7 minutes total, the fish should be cooked through but still nice and moist. Remove the char from the grill and place on a large platter. Plate a portion of the pasta, topped with a scoop of the kale pesto. Spread the pesto over the fish. Repeat for the other servings, and enjoy! I love simple recipes that is full of flavors like this one!! Looks so delicious! Thanks, good luck finding the wine! I am a big fan of seafood, but I’ve never heard of char before! I wonder if we get it in the North Sea? What a gorgeous recipe! Thanks! It might be found in the North Sea. Arctic Char is found in alpine lakes and arctic and subarctic coastal waters. We adore arctic char. It has a great flavor and I can see how it would nicely pair with kale pesto. I’m adding that wine to my list to try. Thanks Christie, I’m just starting to appreciate char. I’ll have to see if you have some recipes for me on your site!